Japan's Kosuke Kitajima is caught in an infernal struggle with the American Brendan Hansen for supremacy of the breaststroke sprints and will be defending his Olympic 100m and 200m titles in an ongoing struggle that saw the Kitajima beat Hansen's 200m world record in June. Kitajima's rise was astronomical. Fourth in the 100m breaststroke in the Sydney Olympics at 17, he was to smash American Mike Barrowman's 200m breaststroke record of ten years standing with a time of 2min 09.97 at the 2002 Asian Games of Busan. He thereby became the first Asian to hold a men's world record since Nobutaka Taguchi took the 100-metre breaststroke record at the Munich Olympics in 1972. Katajima confirmed his potential a year later at the Barcelona worlds while still a 20-year-old university student by seizing not only the world titles over 100m and 200m with his trademark turn of pace over the second part of the race, but also by setting new world records in both finals. For the record, Tagushi's Munich record was 1min 04.94sec over 100m, while Kitajima's chrono 31-years later was 59.78sec. But a month ahead of Athens, Hansen set stunning new world marks over 100m and 200m and was talking up a fight to anyone who would listen. Kitajima listened and replied in style in June 2008 when he regained the 200m world mark in Tokyo, just under a second faster than Hansen. Kitajima was seeking Japan's first Olympic swimming gold for 12 years (Kyoko Iwasaki won the women's 200m breaststroke in 1992) and already had a track record of rising to the big occasion. The first clash between Hansen and Kitajima came in the 100m, where Kitajima came from behind at 50m to win by 16 hundredths of a second, Hansen's team unsuccessfully protesting at a so called dolphin kick the Japanese made on his turn. In the 200m Kitajima led from start to finish, Hansen losing heart in the closing metres and Hungarian teenager Daniel Gyurta grabbing silver. Hansen's words "An Olympic medal is for life, a world record can be broken in a day" must still be haunting him. At the 2005 worlds, Kitajima took 2nd to Hansen in the 100m and the American also took the 200m title as the Japanese struggled against his own motivation. At the 2007 worlds, Hansen again claimed the 100m just ahead of Kitajima. The Japanese's reaction was to say that he had expected to win, that Hansen had been better than he'd expected and finally, said he'd now have to go faster in the first 50m. An unnervingly, cold self analysis, that must have pleased his coach. 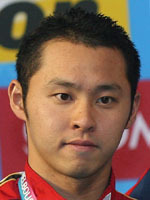 Kitajima won the 200m gold at those 2007 Melbourne worlds with Hansen sick. So one thing is for sure at Beijing, the rivalry for these breaststroke golds should be a brutal test of nerves and quite simply thrilling for the spectators.